Arizona Landlord Tenant Blog: How much advance notice of termination is required in a month-to-month tenancy? How much advance notice of termination is required in a month-to-month tenancy? 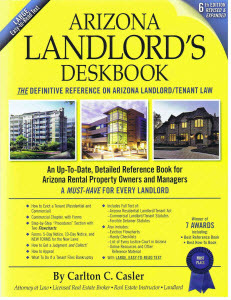 A residential month-to-month tenancy in Arizona may be terminated by either party providing the other party with a written notice at least thirty days before the end of the next “periodic term” and tenancy must terminate at the end of a “periodic term.” (See A.R.S. Section 33-1375.B: http://www.azleg.gov/FormatDocument.asp?inDoc=/ars/33/01375.htm&Title=33&DocType=ARS ). In a month-to-month tenancy, the “periodic term” is one month. For example, if you want to terminate tenancy on November 30, then you must give a written notice of termination on or before October 31. If you give the notice on October 15, tenancy still terminates at the end of November, NOT on November 15, because tenancy must terminate at the end of a “periodic term.” You must take care that you give a full thirty days advance notice. Don’t count the day you hand-deliver the notice. If you serve the notice via certified mail, then add another five days, which means you would need to give thirty-five days advance notice. Be careful to calculate the days properly; some months have thirty days, some have thirty-one days, and February has twenty-eight or twenty-nine days. I'm assuming this would apply to the raising of rent in a month to month situation as well. By increasing the rent one is effectively ending the previous agreement and beginning another. The periodic term is the date the rent is due not just at any time 30 days from receipt of letter. My rent being due mid month would require 30 days notice in writing prior to when my rent is paid. If i receive notice on the first of a month my rent does not increase nor may my lease be terminated until 30 days after my next rent payment. Why does legal stuff always have to be so complicated? I know there's more to it than just to make feel stupid. Although at times i really wonder. Thanks for posting the information sir. RESPONSE BY Carlton C. Casler. Yes, you are correct. If rent is due on the fifteenth of the month, then notice on the first of that same month DOES NOT raise the rent OR terminate tenancy. Thank you for sharing! Your blog provides a great resource and a wealth of information for us and our tenants alike.